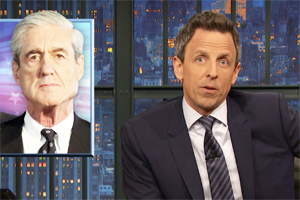 The expanded special edition of Late Night will allow Meyers to delve into Special Counsel Robert Mueller’s redacted report, which is being released earlier Thursday. Meyers also planned to welcome Leslie Jones to talk about Game of Thrones in a "Game of Jones" segment. So the 90-minute episode will allow Meyers to do both "A Closer Look" and "Game of Jones." "I simply will not stand for the Mueller report bumping Leslie Jones or vice versa, so we decided to make room for both," said Meyers. Also on Thursday, Late Night is welcoming guests Democratic presidential candidate Pete Buttigieg, Amy Sedaris and Toro Y Moi.